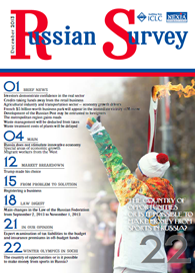 The Federal State Statistics Service (Rosstat) published the data on foreign investments into the Russian economy. 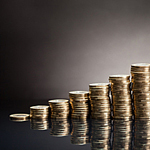 According to the results for the first nine months of the current year, there is an investment boom in Russia – during this period the investment inflow amounted to USD 132.4 bln. The growth of the retail trade turnover and consumption was slowing down in the second half of 2013, according to the data disseminated by Sberbank CIB economists. Thus, based on the results for the 10 months, the retail trade turnover growth was 3.8 %, in October it was just 3.5 %. According to Sberbank CIB specialists, it was caused by the fact that people have to spend more to serve credit obligations assumed. As a result, the retail trade gets less and less money. 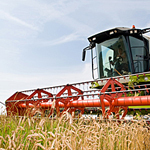 The expiring year was a rather successful one for the agricultural industry – the yield of practically all types of agricultural crop was good, and it had an immediate impact on the macroeconomic indicators in the industry. According to Sberbank CIB, the annual growth in the agricultural industry reached 26.3 % in October and 5.3 % in 10 months of the current year. 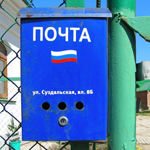 The Ministry of Telecommunications and Mass Communication (Minkomsviazy), which is in charge of the largest Russian postal operator – the Russian Post – proposed to improve efficiency of the later through its corporatization. However, to do this, the Russian Post will first need to be deprived of its status of a strategic enterprise which prohibits its privatization. The Moscow authorities plan to build more than 300 km of roads in the next two years, and the larger part of this plan (252 km) will be put in operation in the megapolis’ territory, not in the territory of so-called New Moscow. That said, the Government of the capital city plans to spend on road building a record-breaking amount of 272.6 bln rubles proceeding from the fact that not only roads will be built, but also pedestrian underpasses, skyways, tunnels, transportation and interchange junctions and other facilities of the road and roadside infrastructure. In November, it became known that the metropolitan government is in negotiation with one of French investment companies on possible construction of a business park in the Vnukovo Airport area. It is known that a company specializing in the implementation of large trading and logistics centers and exhibition complexes in Europe and China acts as the investor. 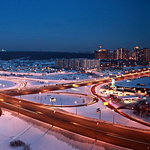 According to a representative of the Department for Development of New Territories of the City of Moscow, the business part will be located at the intersection of the Moscow Railway Kievskaya Line and the Outer Railway Ring, not far from the Vnukovo Airport. The Government of the Russian Federation is considering various possibilities to enable the business community to decrease the taxable base by expenditures relating to the production waste management. For this purpose, a meeting of the Advisory Council for Foreign Investments to Russia was held. Consideration of this problem at such a high level was prompted by the fact that for several years the Russian tax authorities were unable to develop a uniform approach to the procedure for referring such expenditures to tax expenses. The Russian Cabinet of Ministers is ready to listen to the business community and delay the introduction of new strict water treatment standards by 18 months. This resolution was announced by Vice Prime Minister Arkady Dvorkovich when he replied to the criticism with regard to the new law on water use voiced by the participants in the meeting of the Advisory Council for Foreign Investments. We’re better than what people think!